Prime Minister Vladimir Putin’s speech to the State Duma on Wednesday had the ring of a political manifesto ahead of the 2012 presidential elections, politicians and analysts said. In an apparent dig at President Dmitry Medvedev’s image as a reformer and force for modernizing Russia, Putin warned lawmakers against “liberal experiments” that could mar Russia’s drive to become one of the top five economies in the world. In his two and a quarter hour speech Putin credited himself with steering Russia out of the worst recession on record and called for stability, just a week after Medvedev said that Russia needs to go beyond the achievements of the past decade. “The speech definitely illustrates the divergence in the tandem,” said Pavel Baevof the Peace Research Institute in Oslo, who pointed to the differing ideologies of Russia’s two leaders. In recent weeks, Medvedev, 45, has looked increasingly ambitious as he has ordered the government to reverse Putin-era policies. On April 2 Medvedev ordered Putin ally and Deputy Prime Minister Igor Sechin and seven other officials to quit their chairmanships of state-owned companies – a move widely interpreted as part of a pre-election power struggle. The two leaders’ divergent worldviews were fully displayed when Medvedev backed UN intervention in Libya, which Putin likened to a “medieval crusade.” Putin’s speech yesterday before the State Duma was clearly out of kilter with Medvedev’s rhetoric on “modernizing” Russia and weaning the country off its reliance on oil and gas revenues. “Putin’s speech said very much – ‘we do not need any change. We are on track and all we need is stability’,” said Baev. Putin told lawmakers that inflation is now under control and would not exceed 7.5 percent in 2011, while gross domestic product grew 4.4 percent in the first quarter of 2011, and should grow 4.2 percent over the course of the year. Putin also said he expects foreign direct investment to soon rise from $40.5 billion in 2010 to between $60 and 70 billion annually. Politicians said that the positive forecast was designed to pave the way for the December parliamentary and March 2012 presidential elections. “You could read between the lines that the government was trying to select and group these figures so that everything looks just right for the federal elections in a year,” Nikolai Levichev, the new chairman of the Just Russia Party, told Russia Profile in emailed comments. “But the flow of figures was so abundant that at times I couldn’t help thinking that it was difficult to concentrate,” said Levichev who had to deliver a response directly after Putin’s speech. 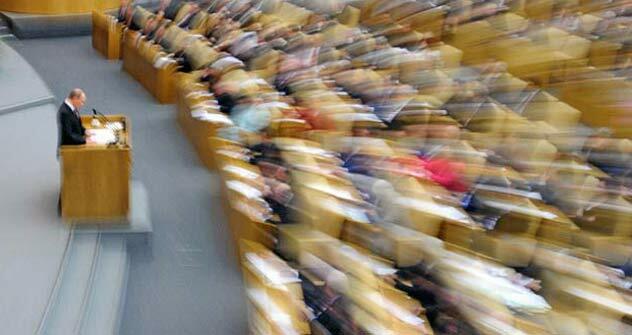 Putin’s two and a quarter hour speech, laden with statistics and indicators, was interrupted only when a cup of tea was brought to him and by regular interludes for applause from the members of Russia’s lower house which is dominated by the United Russia party. Boris Shatilov of the Center for Political Assessments said that the “promising” socio-economic picture painted by Putin affords the powerful premier various political avenues in the next year. “We mustn’t rule out from these words that after 2012 Vladimir Putin sees himself in one or another different post – be that the presidency or some other post,” said Shatilov. Medvedev recognized in China that he and Putin have “perhaps different views” on how Russia should develop and also said that the "the decision will be taken very shortly" on who will run for the presidency. Asked for his reaction to Medvedev’s comments days later, Putin first dodged the question irritably before asking:"Again? Not being very original, are you? Medvedev and I have been continually asked this question..."
Putin then reaffirmed that he and Medvedev would decide between themselves which of them will run. United Russia says it would prefer Vladimir Putin, who chairs the party, to return to the Kremlin, although it will back Medvedev’s candidature if Putin gives his blessing. It has long been said that the final say on who will run remains with Putin and nothing in the premier’s speech indicated otherwise. “It felt like the whole speech was written without any reference to what Medvedev is saying – which is probably a telling thing,” said Baev. Finally, Putin’s warning to lawmakers to err from liberal “experiments” may not have been a dig at Medvedev, he said. Putin has commissioned a number of working groups to research possible changes to Russia’s Strategy 2020 and in the course of his update on the economy made no mention of them. “This probably comes as more of a shock to the experts in those working groups, rather than Medvedev,” said Baev.